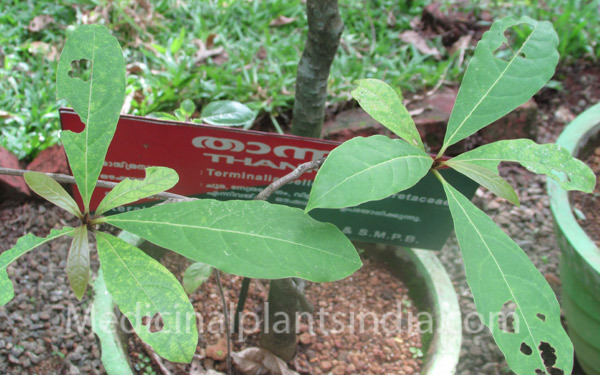 Beach almond (Terminalia Bellirica) is a deciduous tree, grows up to 34 m high, barks are blackish-grey, smooth and 10 to 20 mm thickness. Leaves are simple, arranged oppositely or alternate, clustered at apex of branch-lets, 8 to 20 cm long and 4 to 14 cm broad, elliptic or ob-ovate, the tip is rounded. Flowers are greenish yellow, 5 to 6 mm across and in axillary spikes. Fruit is a drupe 2 to 2.5 cm and 1.8 cm, yellowish-brown, ob-ovoid, one seeded and ellipsoid. 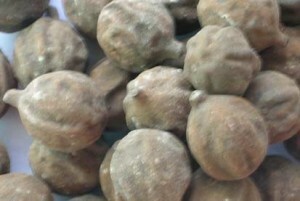 One of Triphala, it is used to treat indigestion, loose motion, hiccup, cough, respiratory problems, diabetic etc.